Always on the look out for buying coffee wherever I am, I went back to a cafe in central Vienna, just off the Naschmarkt, Alt Wien Kaffee on 23 Schleifmuhlgasse, A-1040, Vienna. It doesn’t look too exciting when you walk in, but on your left there’s a massive Probat Coffee Roasting machine, which was roasting green coffee at the rate of 12 kilogrammes per 12-15 minutes. 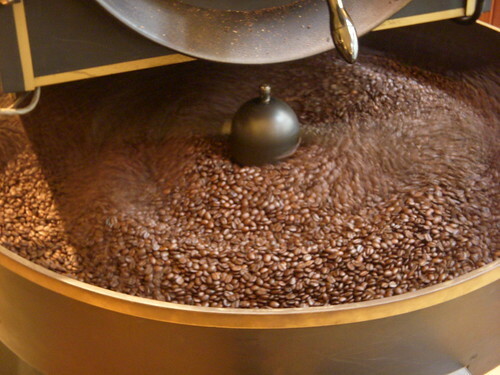 During my visit around lunchtime, the machine stopped and all this lovely freshly roasted coffee poured out and the air was awash with freshly roasted coffee beans, ahhh !!!! Back to the shop, coffee beans are displayed in metal-like boxes, offering a choice of 19 different types of coffees, mainly house blends but for the eco-friendly and trade conscious amongst us, there’s also a selection of 6 fairtrade and bio/organic single estate coffees. There’s also a small place to drink coffee round the back and up some stairs, where your coffee can be made on a La Spaziale espresso machine. At the shop front, they also sell some minor coffee equipment like French presses, moka pots and drinking glasses as well as fancy chocolate and something unusual, used green coffee bags, which are more like sacks, and can be used for decoration. Now for the real stuff, I tried an espresso, which they can offer you in 3 strengths as mild, medium or Italian strong – well, I had to try the strong stuff naturally. I checked the techniques, and although a tamper was used, my crema wasn’t dark reddish and caramel like and didn’t last minutes before disappearing – I therefore think their strength is in selling coffee beans. Now ! time to buy coffee. As a bit of a purist, I headed straight for their organic Fairtrade Papua New Guinea coffee for my dosage of afternoon coffee. I tend to drink cafetiere (French press) coffee in the afternoon and so favour either bold African coffees or flavoursome Central American coffee. However, on this occasion I decided to try something from the Pacific Ocean – just in case you are wondering where Papua New Guinea is – right above Australia. I still wanted something different for my daily espresso and cappuccino fixes and was persuaded to try their Scarlatti blend, advertised as ideal for an Italian espresso, consisting of 85% arabica and 15% robusta beans – I am a bit fussy about finding the source of things and tend to shy away from blends that do not offer the full listing and percentages of the origins of the coffee beans used in a blend, but again on this occasion I decided to bend my rules. On first impressions, the Scarlatti blend has a bitter and woody taste and does look like an Italian espresso. The Papua New Guinea coffee is just what I expected, a bit light, but flavoursome nevertheless. 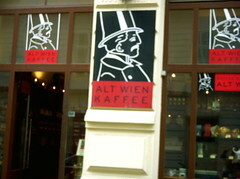 Alt Wien roast their coffee weekly and so promise freshly roasted coffee beans and their prices are quite reasonable, where the average 250g bag cost less than 5 Euros ($7). 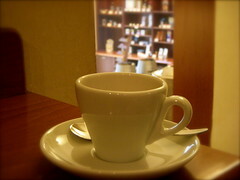 They have also opened another cafe on 32 Josefstadter Strasse, A-1080, Vienna. This entry was posted on Wednesday, January 30th, 2008 at 3:27 pm	and posted in Bean There - Cafes. You can follow any responses to this entry through the RSS 2.0 feed.